The Laxmi Niwas Palace is situated in Bikaner and made by Late Maharaja Ganga Singh, the maker of modern Bikaner, who personally conceived, foresaw and supervised the construction of his personal residence. 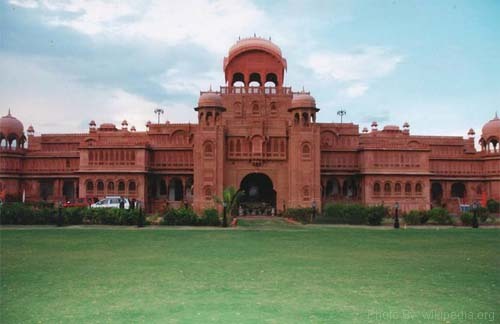 The Laxmi Niwas Palace is a magnificent red sandstone structure designed by Sir Swinton Jacob in the Anglo-Scenic style. This stately building, great & grand, is built around a central courtyard and is intricately carved from the skirting up to the highest dome. The building has some exquisite stone ‘jali’ work or lattice is awesome and stunning. The motifs, floral and geometrical, will leave you hypnotized by the work of art. A lace- like work of stone on the edges of the entire roof was created as a splendid crown on the head of the palace!! The royal palace of Laxmi Niwas Palace has a huge principal entry gate. The Clock Tower which is secured by guards and reminds memories of old dignity and grandeur.The palace has the vast lawns with rows of trees, fairly big pools, and red sandstone housings. The huge entrance stretches to a warm and dignified welcome to the visitor. The monument art on the pillars are really captivating and attract the eyes along with the ceilinged Portico, looks gorgeous with the decorative carving. The wide area of grand staircase leads you up to the reception which extends a warmth of hospitality to the visitor. It is the pilot to the extensive hallways and the inner courtyard, which is normally called as “chowk” blessed by the memories of festive occasions and gracious functions of Rajasthan. In this place where Gala dinners are arranged every day accompanied with folk music and dances by dholies and langhas. The main attraction of the dinner is a fireworks display. As far as the hotel amenities are concerned then all the rooms have been refurbished with exquisite soft furnishings and the bathrooms have been made ultra-modern keeping in mind the needs of the new tourists every time. All rooms are air conditioned and have attached separate dressing rooms to the bathrooms, bathtubs, hot and cold water, and direct dial telephone, colored T. V, Refrigerator and 24 hours satellite entertainment. A 24 Hour Coffee Shop serving delicacies from around the globe will refresh you from all the tiredness. On the walls, you will find hung rare trophies, images of the sportive hunting hobby of the Rajputs. A lavish specialty restaurant known as Swarna Mahal serves authentic North-west cuisine with a terrific artwork done in pure Gold is true to its name. Complimentary Rooms Amenities : Hair Cleanser ,Body Cleanser ,Moisturizer,Soap,Shower Cap,Shaving Kit,Sewing Kit,Laundry Bag,Comb,Tissue Paper Box With Tissue,Shoe Shiner,Dental Kit,Sleeper,Mineral Water 500 ml,Tea Coffee Maker with Flavoured tea,Notepad With Pencil,Wifi Services in the Public Area, Safety Lockers. Swarna Mahal : Swarna Mahal serves up a dauntingly elaborate traditional Rajasthani thali and other regional cuisine with élan. Lal Maas, or mutton cooked in gulmohar flowers, is a huge draw. Their chef is partial to Thai, Indian and very many Continental staples. And if what you’re feeling like is not on the menu, have a chat with chef. Your request will likely not be beyond his vast culinary repertoire. Hari Mahal : It is banquet-style dining room has huge ceilings and a Messel Green decorative motif. On its broad wall-length tables and sideboards, substantial breakfast buffets are laid out daily as is lunch or dinners for those of our guests who engage the venue for private functions.